Guitar shielding is recommended, for single Coil pickups used in the majority of Stratocaster (and Telecaster) style electric guitars, as they are inherently susceptible to picking up (electrical) noise. In fact you could say its part of the tonal characteristics of this style of pickup along with bell like clarity. This unwanted noise is not necessarily a fault of the guitar or pickups design, its just a side-effect of pickups being constructed from a high number of windings of copper wire - a perfect 'noise' receiver! This is not usually a problem playing in a home / bedroom situation, but rapidly becomes an issue in public environments where lighting, radio mics and PA systems contribute to the surrounding electrical noise. 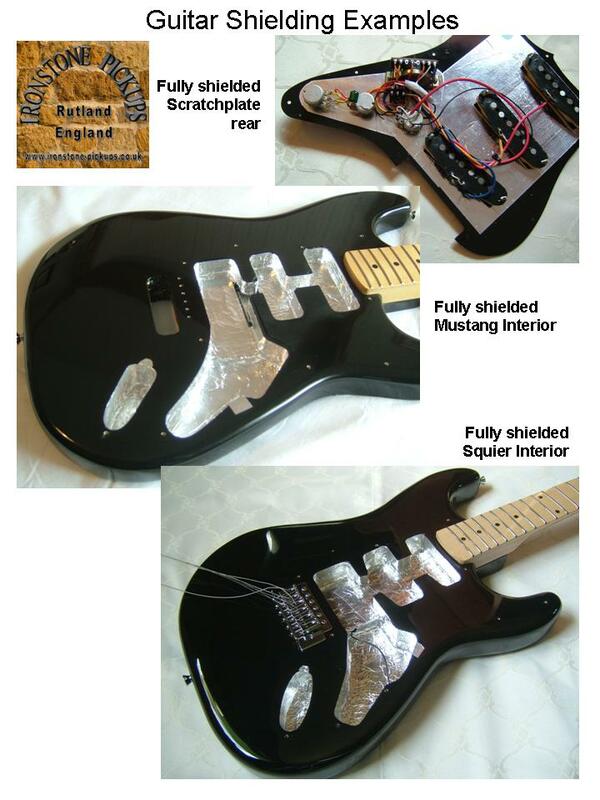 Whilst this can be overcome to a large degree by using more expensive pup designs like the Fender Noiseless, active pups such as the excellent EMG's or Humbucker designs (which 'buck' the hum / noise by having two 'opposing' coils), this page focuses on what level of guitar shielding can be done cheaply and simply with a standard guitar and single coil pickups. This section describes the steps for a self adhesive foil example. For all of the steps its easiest to pre-cut the pieces to a fit their areas with around 1/4" over-size to allow overlap with adjoining pieces. To ensure an electrical connection between adjoining pieces once stuck in place, use a sharp pointed object (e.g. a nail) to push through the top overlapping sheet into the piece below. Do this every 2 inches or so along overlaps. Then use a resistance meter if available to ensure electrical continuity between the different pieces, ensuring maximum guitar shielding. > Coat the inside of the jack socket cavity. Use one piece to do the oval shaped bottom and a strip to run around the sides that overlaps itself and the bottom. This side piece should not protrude over the top of the cavity. > Add a small tab of foil that runs up the inside of the jack socket well and then protrudes over the top of the body and covers the screw-hole nearest the bridge where one of the jack-plate securing screws goes. This will connect the 'earthed' jack plate to the socket cavity shielding to electrically complete the shielding. > As a precaution, adding some insulated tape on top of the new foil in the area where the jack socket tip will be ensures the guitar signal is not accidentally shorted to earth. > Follow a similar process for the main body cavities including the pickup wells. Each body varies slightly and several overlapping pieces of foil will be need to cover all of the bottom areas. Ensure they are electrically connected as described above. > Now coat the sides, again typically using several pieces of foil due to the differing depths of the cavity. > Add another small foil tab that comes up the control cavity side wall and over the screw hole that secures the scratchplate near the lower middle of the guitar body (see second & third picture). This will be the electrical connection to the scratchplate shielding. The basic scratchplate will typically have a triangle of shielding foil on it around the controls. The earth connection from the amp via the guitar lead is normally soldered to the metal body of the volume potentiometer. This pot is screwed down onto the foil triangle giving the electrical connection to earth. Add a small tab over the scratchplate screw-hole to align with the one on the body. This will complete the electrical guitar shielding connection when the scratchplate is fitted and screwed down. For the very best guitar shielding, the scratchplate foil triangle should be extended as shown to cover the entire pickup are as well. Having done all these steps, ensure that there is solid continuity of resistance between the 2 tabs and their respective shielded area. Note that as a precaution, you can put some insulating tape over the contacts on the bottom of the 5 way switch, just to ensure they do not make contact with the body guitar shielding. Now you can sit back and enjoy a much quieter single coil experience - simple as that!